The Midwest's finest high school marching bands gather in Alexandria for the Vikingland Band Festival parade marching championship. Summer parade bands are at their peak in late June and they pull out all the stops as they perform on the city’s extra-wide main street. Eight different bands have claimed the Grand Champion title in the Festival's 34-year history. Join us to see who rises to the top in 2019! Another fantastic lineup: This year's parade features a full roster of 20 high school bands plus the Alexandria Alumni Band in exhibition. That's a total of 1,700 performers in 21 marching bands! JOIN THE ALEXANDRIA ALUMNI BAND! Be part of the tradition! The Alexandria Alumni Band has been forming every five years, and the group will gather in 2019 to celebrate the 35th Annual Vikingland Band Festival. The experience is equal parts reunion and performance ... visit the 2019 Alumni Band Info Page for details and to register! 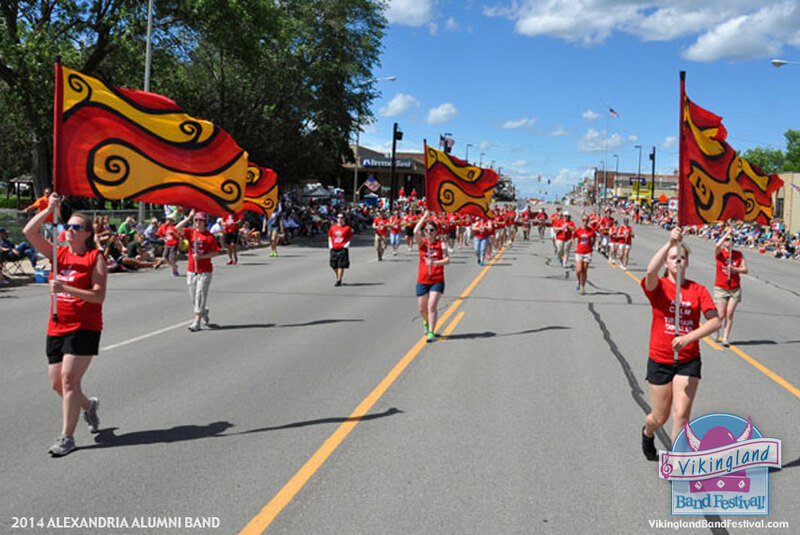 Relive the excitement of the 2018 Minnesota Drum Corps Premiere and 34th Annual Vikingland Band Festival parade marching championship. View the 2018 photo gallery of 158 images featuring every band and drum corps. Henry Sibley H.S. earned the Grand Champion title at the 34th Annual Vikingland Band Festival, capping an exciting summer marching season where multiple bands were in contention for the top award. It was Henry Sibley's second Grand Champion win in Alexandria, having also earned the title in 1986. Seven bands scored above the 80-point mark in the competition, which indicates the depth of quality in this year's lineup. The Mankato 77 Lancers placed second overall and earned the Class AAAA Champion title for the first time since 2012. Waconia was named "People's Choice" for the seventh time, tying the record of seven wins held by the Mankato 77 Lancers. The Alexandria Marching Band served as host for the parade which featured 19 ensembles including special honor unit River City Rhythm Drum and Bugle Corps. Did you know that 93 different bands have appeared in the Vikingland Band Festival since its inception in 1985? Browse the Festival archives to access scores and participants from previous Festivals. Alexandria is the only band to appear in every Vikingland Band Festival, but many bands have a long history performing in the festival. Including 2018 appearances, these bands have appeared at least 15 times: Alexandria (34), Bertha-Hewitt (31), Fergus Falls (31), Waconia (30), Henry Sibley (29), Mankato Lancers (29), Winona Cotter (29), Long Prairie (27), Park Center (27), St. Cloud All-City (24), Litchfield (22), Sauk Rapids (20), Osseo (18), Albany (17), New York Mills (17), Albert Lea (16), Kerkhoven-Murdock-Sunburg (15). 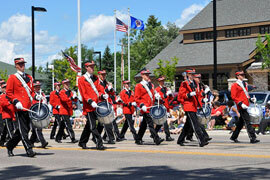 "Like" the Vikingland Band Festival on Facebook to stay informed of last-minute updates, news and Festival history.